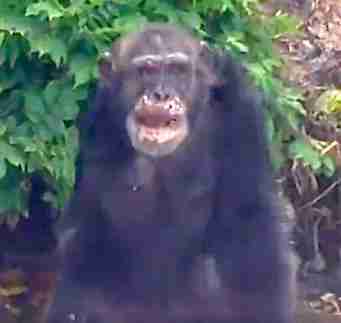 A 39-year-old chimp named Bullet has been poked and prodded for most of his life. He was put under anesthesia over 400 times. He underwent 55 liver biopsies. He lost an arm just after his capture in the wild at age 3. And then he was abandoned on a string of tiny islands, along with 200 other chimps, off the coast of Liberia. Only 60 or so survived. And yet Bullet still trusts people. New footage shows Bullet patiently waiting in line for a cup of water. He - and the chimps he was left with - depend on human help to survive, since they've known only the New York Blood Center's (NYBC) research facilities most of their lives. Bullet's plight is actually very complicated. The money NYBC had been sending to provide for the chimps was pulled in the spring of 2015. Even though Jane Goodall and other famed advocates called on the NYBC to reinstate funding, the NYBC refused to take ownership of the chimps, instead claiming they belonged to Liberia - essentially saying the chimps are Liberia's problem now. Animal advocates were outraged by the announcement and have called on the NYBC to do more for the chimps, who were used in studies for serious illnesses, like HIV and hepatitis. But since no one seemed to be willing to shoulder the responsibility for the survival of Bullet and the other chimps, their future was precarious. As it is, volunteers from organizations like The Humane Society of the United States (HSUS) and Humane Society International (HSI) have been raising money to send volunteers to Bullet and his peers. "We've been caring for these chimps for more than a year, at great expense, in what amounts to yet another unfunded liability for the animal protection movement, with irresponsible actors dumping the cost of care on us," Wayne Pacelle, president of HSUS, wrote in April. "Thankfully, so many people are stepping up with generous support." Thanks to this support, the boats can come. When they do, Bullet wades out from the shore with the others, limping slightly as he keeps his balance. People get out of the boats and move toward him. They reach out and pour fresh water right into his mouth. 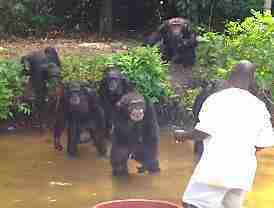 For the chimps NYBC wanted to forget, a cup of fresh water can mean so much. 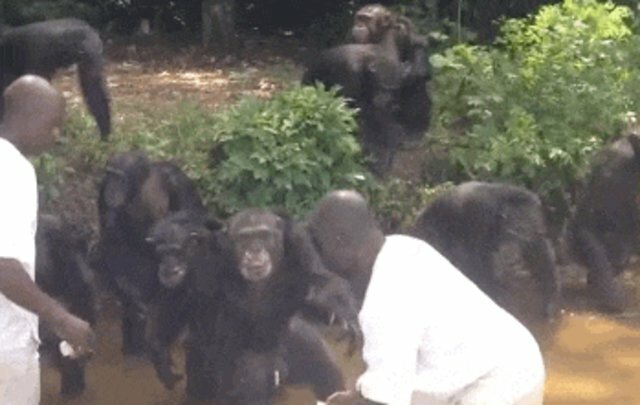 Click here to donate to the care of the abandoned chimps. Click here to sign a petition urging NYBC to reinstate funding for their care. The NYBC did not reply to The Dodo's request for comment.